Yesterday I got the most gorgeous yarn as a birthday present. It’s a 65% cashmere and 35% silk blend and I want to crawl inside a skein and just die of happiness. Posted in Knitting and tagged yarn. Bookmark the permalink. Last year a friends asked me to design her a lace shawl that started with plain stockinette stitch and ended in lace, the transition should be organic and not in stripes or too random. So after a lot of charting and re-charting and getting new ideas I finished knitting my prototype of the shawl in may. And now after a lot of test knitting and editing and puzzling all the parts together I started my very first self hosted mystery KAL. The shawl is inspired by snow fall and thous named “Frau Holle” (Mother Hulda in english) one of my all time favourite fairy tails as a child. You can join HERE and for chatting and posting pictures later please join my new group. Posted in Designs, Knitting and tagged design, fairy tales, Frau Holle, KAL, knitting, lace, once upon a time. Bookmark the permalink. I already own a spinning wheel, a Wernekinck Delft to be precise, for two years now. It’s a really lovely little thing I got from my parents. I had to scrub a lot of let’s-not-think-about-it-stuff from it after the wheel lived in a very wet cellar for over 20 years. But apart from the cleaning and oiling the wood again it was fully functional and working. For my learning curve I bought 2kg of undyed wool and experimented with different drafting and dying the wool/yarn. Most of that yarn is or will be made into Doctor Who inspired squares and then sewed together to form a blanket. 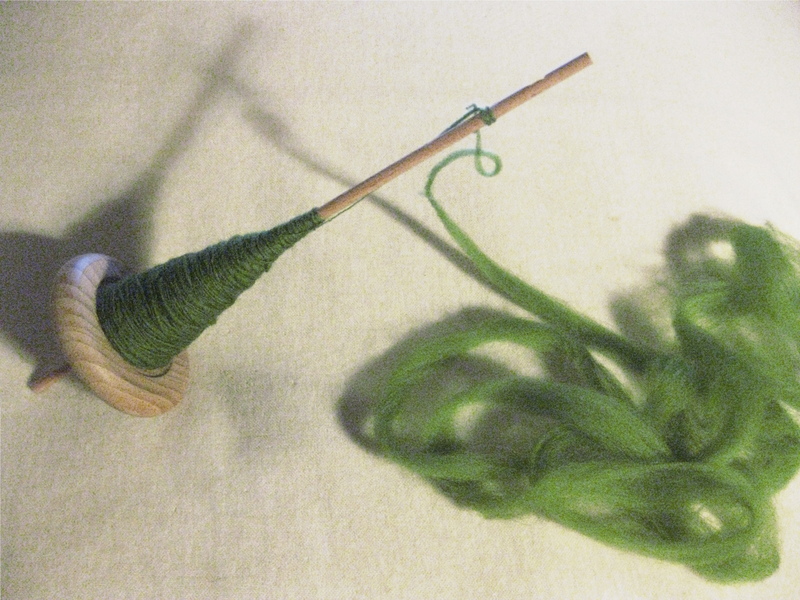 So the wheel is working good and I’m getting even yarn (we all have bad days) out of it. 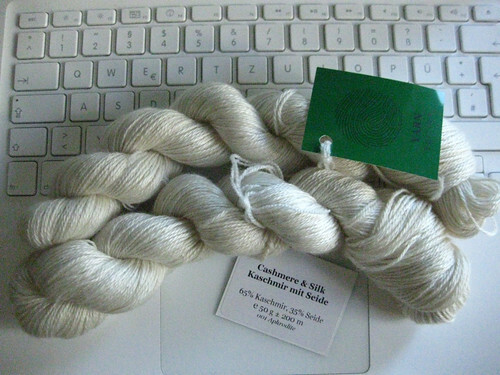 But it’s really not suitable for spinning lace yarn and I really didn’t had fun with the cashmere. Ok the cashmere spinning being a total failure could be because I wasn’t a good spinner then but I’m sure the wheel had it’s part too. So last thursday while being at a DIY store I bough a little toy wheel and a matching stick for under 3€. I had to adjust my drafting a bit but it’s already looking quite nice, let’s hope that structure is still there after setting the yarn. 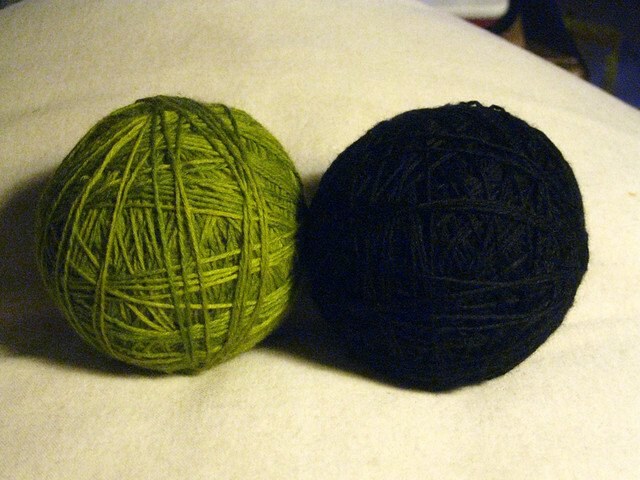 The fibre is some lovely merino I got from a friend, it was in a package with 10 different shades of green. I already spun up two of those on my wheel and now will spin the others on the spindle and maybe knit them all together into something shawl-like. Posted in Spinning and tagged Doctor Who, green, spinning. Bookmark the permalink. Some time ago I swapped half a skein of Wollmeise in Mitternacht for a skein of lovely Three Irish Girls Westerly Sea Sock in Kathrine Hepburn. As soon as I had that lovely merino and sea silk yarn in my hand I just wanted to pet it it’s so soft. Further to knitting one of my passions is reading. I usually have two or more books I read (atm “See Delphi and Die” by Lindsay Davis and an 8th Doctor novel). So I though about combining my love for knitting (and that special yarn) and my love for books in a pair mitten. 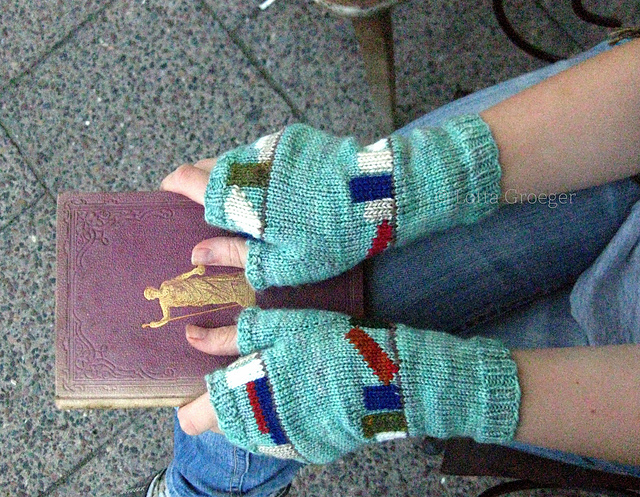 They are perfect for keeping your hands warm but you can still easily hold a book and turn pages. The book my friend Nina holds in the picture is a 1877 edition of the Ilias or to give it its full german title: “Die schönsten Sagen des klassischen Altertums, zweiter Teil, mit 40 Holzschnitten”. The first book of that series is in a good condition too, but the third (Odyssey) one is sadly missing it’s spine. I made the books with duplicate stitching and used less then 1m or 1 yard per book so I used up some of my scrap yarn collection that would usually go to my blanket. Posted in Designs, Knitting and tagged books, design, green, knitting. Bookmark the permalink. Well that and the buttons, I don’t have a good picture of the tangled yoke cardigan yet but there will be one. 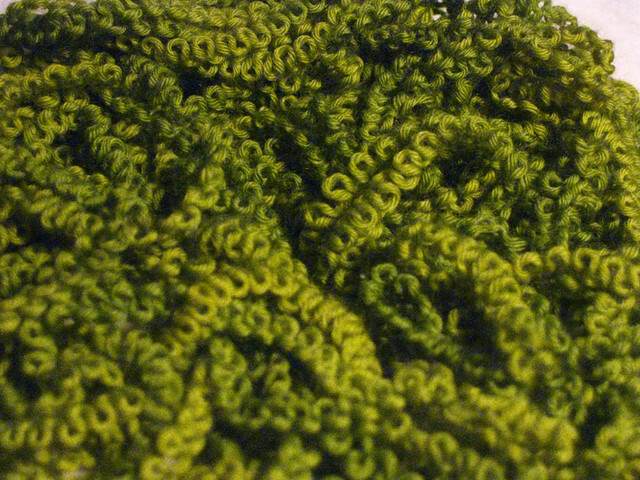 I find frogging, and untangling yarn for that matter, deeply relaxing and quit like the frogging-in-progress-look of yarn. Too bad the knitting/crocheting is always a lot more work then the frogging. I’m now in the 3rd of 6 (planned) chart. It’s nearly big enough to knit in the round on the whole cable, at the moment it’s a little awkward to magic loop the thing. Sometimes I have the feeling my designs are a little too complicated to knit. This one has a lot of real lace (no non-patternd rounds), but I really like the look of the patterns I’m using. 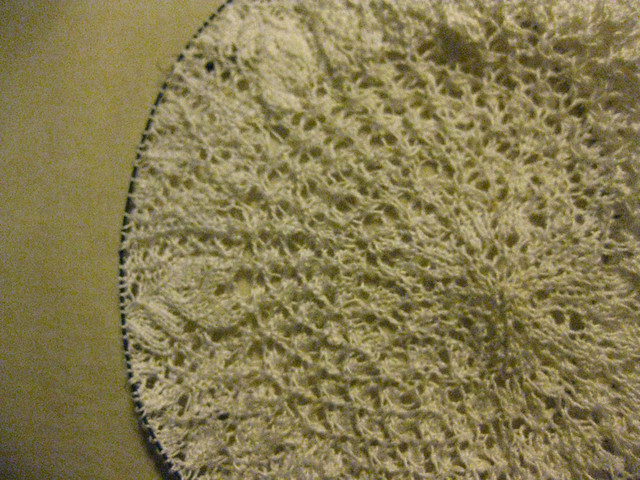 And even though it is real lace and I have to look at the chart for every round it’s still easy and intuitive to knit. Next thing for this project is to find a cheap but not to flimsy umbrella that has a nice black handle. Posted in Design in Progress, Knitting and tagged buttons, design, fairy tales, frogging, green, knitting, lace, lady of the lake, once upon a time, parasol, Wollmeise. Bookmark the permalink. Jup I just wrote about how I’m not good at planning with “what to knit on the road” but I did it again. Today I took a pair of socks to knit meeting in such an early stage I needed to count all the time. Posted in Knitting and tagged knitting. Bookmark the permalink. Thanks to the really brilliant comic book series “Fables” I found my love for fairy tales again. Ok I started to hate strange persons and fall for ones I never liked in the original fairy tales but that’s a great comic book for you. The first one published are my wilde Schwäne mitten. Lovely not to long mitten for a friend who loves the fairy tale “wild swans” by Hans Christina Anderson. They are knitted in Wollmeise Frosch (yes the scrapes from the Tempest Cardigen) and the nettles are made with the roositude inlay method. The inlay method is really easy and something for knitters who (like me) aren’t good with stranded knitting. You weave in strandes of the contrast colour while knitting so you don’t have to fiddle with tension after knitting. With the code “Brennesseln” you get a 10% discount for them. Posted in Designs, Knitting and tagged design, fairy tales, green, knitting, once upon a time, Wollmeise. Bookmark the permalink.